How is the Testmasters PE Civil Exam Course Set Up? Review Course: Theoretical concepts are explained to refresh and give students an understanding of important PE Civil Exam topics. Many example problems are worked out in class to reinforce these concepts. The focus of the Testmasters PE Civil review course is to review the important concepts needed for the exam and begin the development of the student’s problem-solving proficiency. Problem Solving Workshops: The workshops supplement the review courses for the examination. Since the actual examination is focused on problem-solving, the PE Civil Exam course will provide intensive problem-solving practice to enable students to perform at their highest capabilities on the exam. The Testmasters PE course workshops focus on the depth (PM) examinations, which can certainly help to increase the score in the breadth (AM) part of the examination. 100% of classroom time is devoted to solving exam-like problems and strengthening the student’s proficiency within a timed environment, similar to that on exam day. The PE Civil Exam Test Course will cover 72 hours of classroom instruction. Review Course: This 36-hour review course covers selected topics from the following: Traffic Systems, Transportation Systems, Structural Analysis and Design, Foundations and Retaining Structures, Geotechnical, Hydraulics, Pumps, Hydrology/Groundwater/Wells, Water Treatment, Wastewater Treatment, and Construction. Workshops: There are 12 workshops each of three hours on the following subjects: Traffic Systems, Transportation Systems, Structural Design I & II, Foundations & Retaining Structures, Hydraulics, Hydrology/Ground Water/Wells, Water Treatment, Wastewater Treatment, Geotechnical, Construction, and Timber/Masonry Design. What is the format of the PE Civil Exam? The PE (Civil) examination is in breadth and depth format. All examinees work the breadth (AM) exam and one of the depth (PM) exams. The breadth exam contains questions from all areas of the discipline. The depth exams focus more closely on a single area of the engineering discipline. PE (Civil): The PM depth exams are in Environmental, Geotechnical, Structural, Water Resources, and Transportation. The AM breadth covers all of these areas. Testmasters knows the PE Civil Exam. The Testmasters Civil PE Exam Coordinator has been teaching the Civil FE-CBT and PE courses for over 25 years, and is very well versed with the format of the exam and what it takes to pass it. Our instructors come from the industry and academia, and are highly qualified in their specialized fields. 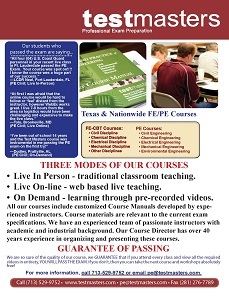 They have taught the Civil FE-CBT and PE courses for many years at various companies including Central and Southwest Services, Bechtel, Kellogg, Fluor, Sirrine, Lummus, Ericsson, Texas Instruments, Foster Wheeler Energy Corp., Texas Department of Transportation, Virginia Department of Transportation, Utility Engineering, and the City of Austin Electric Utility Department. Although most of our students start our course with little to no preparation, we guarantee that all Testmasters Civil PE Exam students will successfully pass the exam, given that students attend and participate in all review courses and workshops of the program. For some PE Civil Exam course locations, the review course and workshops are offered separately, and in other locations the review course and workshops are combined as one complete course. The Testmasters Guarantee of Passing only applies when both the review course and workshops are taken together.